The month of November has 2 birthstones, Topaz and Citrine. We’ve collected some facts about these beautiful crystals, so read on to find out more! This stone gets its name from the word “Topazios”, which is the ancient Greek word for St. John’s island in the Red Sea. It is unlikely that the stones mined there were Topaz. This soon became the name for all the most yellowish gemstones. Topaz can come in a range of colours, including yellow, green, brown, blue, pink and red. Sometimes they can even be colourless. The most prized colour is known as “Imperial Topaz” which is a bright orange hue with hints of pink. It is also sometimes known as the “soothing stone”. This is because it’s said to calm tempers and eliminate nightmares. Citrine’s name comes from the “citron” fruit because of the stones lemon inspired shades. Citrine can range in colour from pale yellow to brownish-orange. The stone is a good option for wearable jewellery, as it is a 7 on the Mohs scale. This means it’s relatively durable against scratches and small, everyday wear-and-tear. It's also very affordable. It's likely that these factors are what makes Citrine one of the most frequently purchased gemstones. Similarly to Topaz, Citrine is said to comfort, calm and erase negative feelings. Because of these soothing powers, it’s known as the “healing Quartz”. 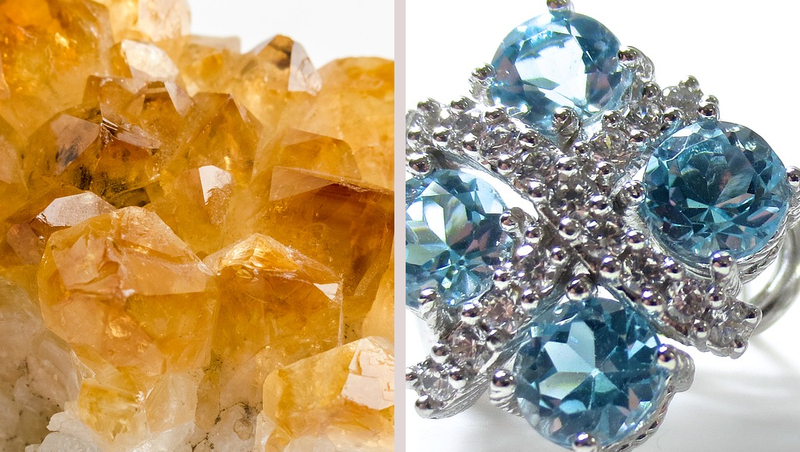 Do you have a favourite of these two November birthstones?